F orbidden Lives: LGBT stories from Wales is the first book on Welsh LGBT history. Here its author Norena Shopland tells us more. What time period does Forbidden Lives cover? It stretches across the ages. It starts with Gerald of Wales, which is medieval, and goes up to the present day (it’s got Jan Morris in it – who is still alive and wonderful). It’s only the tip of the iceberg really; there were so many people I wanted to include but – just space-wise – we couldn’t. I didn’t want to include people about whom a lot is written, like Ivor Novello – you can go online and read all about his sexual orientation. So there’s an awful lot in the book which is either brand new or very little-known, and it’s a case of trying to bring these stories into worldwide LGBT history. So there’s enough Welsh LGBT history to warrant another book? And more. I’m still discovering people. The nice thing about history and research is it never stops. Also, [Forbidden Lives] is short stories about people, but we need a history book about LGBT Wales that relates the subject to England, Scotland, Northern Ireland, and the rest of the world; we need the overarching history book, as it were. Which stories in Forbidden Lives resonate with you? I really enjoyed writing about the women; when you look at Frances Power Cobbe, Mary Lloyd, the Ladies of Llangollen… they just got on with their lives, they just did what they wanted to do. Also Cedric Morris’ story is very touching and funny as well. It really was a privilege to write about these people; the thing that struck me was how fascinating they all were. One interesting figure in the publication is Henry Cyril Paget, the 5th Marquess of Anglesey (also recently the subject of theatre production How to Win Against History). One of the problems I had, when researching the book, was gatekeepers who decide what we can and cannot know. I approached a number of people, and they’d say: “Oh, no, it’s all rumour and innuendo.” And you’d think, “Hang on a second; you can’t make that decision for us.” Some of the figures in the book I’ve deliberately included in order to stop people saying it’s all innuendo and rumours. Henry Paget is one of those figures – he’s quite often dismissed with, “You can’t prove he’s gay.” Well, prove to me someone was heterosexual. Why do this book specifically on Welsh LGBT people? One reason is that in order for people to engage with history we have to give them local heroes – local characters that Welsh schools, colleges and universities can use if they want to address LGBT History Month using people from their local area. The other reason is the enormous influence that Welsh people have played [in LGBT rights]. If you look from about the 1940s, right up to the 1970s, Welsh people have really been at the forefront – playing leading, influential roles. 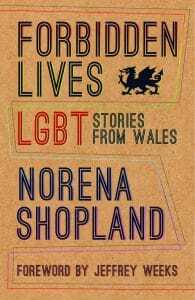 Forbidden Lives: LGBT stories from Wales is available now.